Invalid Pension and Retirement Gratuity, in case of retirement from Government service on invalidation not attributable to Government duty. Family pension (including enhanced family pension) and Death gratuity, in case of death in service not attributable to Government duty. Disability pension and Retirement gratuity in case f discharge from Government service due to disease or injury attributable to Government duty. Extra-ordinary family pension & Death gratuity, in case of death in service attributable to Government duty. Instructions were issued extending the benefit as mentioned above provisionally to the employees of State Government covered by Contributory Pension Scheme (NPS). 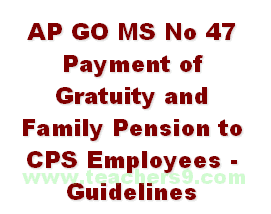 Duly applying similar provisions of the A.P Revised Pension Rules, 1980 with a condition to adjust the payments/relief made to the employees the against the accumulated funds in CPS account, pending finalization of the guidelines. However, while issuing orders vide G.O. fifth read above, adopting exit policy and interim guidelines. The orders issued in the reference fourth read above were withdrawn, as a result of which the benefits of Recruitment/Death gratuity and Family pension, extended an additional relief by the G.O.I vide OM third above to its employees are not admissible to the similarly placed persons in the state government service or their legal heirs.